Its that time of the year when all the hard work that children have put, into their preparation for the boards finally pays off. Just like the class tests that students give during the entire year, for teachers and parents alike to assess the amount the child has learnt and to find out the progress of the child. Similarly, the boards are here bringing with it the age old anxiousness and nervousness or rather the feeling of butterflies in the stomach, all in the anticipation of the exams. Thinking of the board examinations easily sends shivers down the spine because the main aim for most students at the end of the day is to score well and if possible pass with flying colours. All this in order to gain admission easily into the desired courses and colleges of interest. Well the SSC (Secondary School Certificate Exams are conducted by the Maharashtra State Board of Secondary and Higher Secondary Education (MSBSHSE). 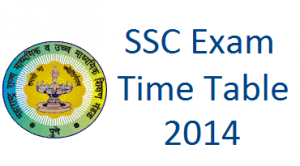 This time around the SSC Exam Time Table 2014 has been announced earlier this year. Hence re-leaving students of their distress. Students should not fret because the MSBSHSE has finally announced the SSC Exam Time Table 2014, so students can now plan their preparation accordingly and with ease. Therefore here is the SSC Exam Timetable 2014. संकेतस्थळावरील वेळापत्रकांची सुविधा ही फक्तमाहितीसाठी आहे .परीक्षेपूर्वी शाळा /कनिष्ट महाविद्यालयाकडे देण्यात येणारे छापील वेळापत्रक अंतिम असेल .त्या छापील वेळापत्रकावरून खात्री करून घ्यावी व विद्यार्थ्यांनी परीक्षेस प्रविष्ट व्हावे. For SSC board examination preparation and writing the examination tips you can visit www.careerfutura.com. So happy planning and All the best! Thanks a lot. I was just looking for this! Well there aren’t any short cuts to scoring well, but a thorough preparation is required. At the very least you can improve your memorisation ability through our memory improvement techniques, which will be of some help. All the Best! Hey, thanks for sharing, now I am plan my study accordingly, can you help me how to score more in less time?? Your welcome and yes you can now plan your studies accordingly. If you are looking for some study tips then our section on study and exam tips will prove useful to you. Hey I too have the same question, so can you help? If you are looking for examination tips you might want to pay a visit to our section on study and exam tips, you will definately get some tips. If you have further questions, you can post them and I will be happy to help. Do you have any tips to write the examination? I’m so glad that you asked because we do. Our section on Study and Exam tips has articles that might be of some assistance to you. All the best!